Have a fax you do not need any more or just want to get rid of, let’s delete it! 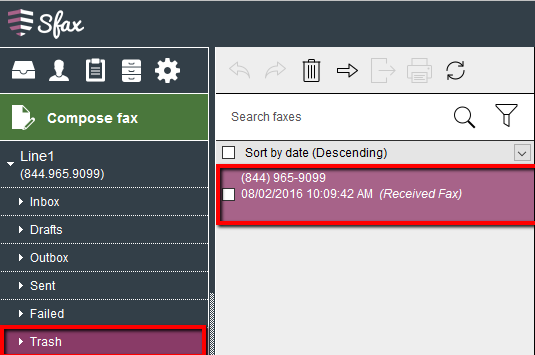 Once you have logged in with a user that has the fax delete permission, you will need to navigate to the fax you want to delete and select it. By default, all Sfax users have the delete fax permission. See Setting User Permissions for outlined information about permissions. 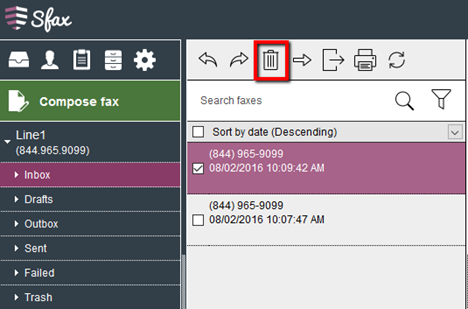 Once you have the fax or faxes selected you want to delete click the ‘Delete’ button at the top of the column. When clicking the ‘Delete’ button you will receive a final confirmation box. 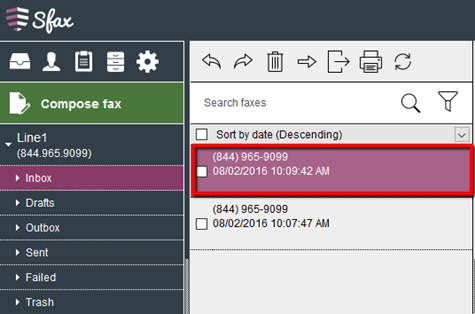 Once you click ‘Delete’ the fax(es) will be deleted and moved to the ‘Trash’ folder. The fax(es) will remain in the ‘Trash’ folder until they are permanently deleted. When you delete a fax from the ‘Trash’ folder you will receive another delete confirmation box however this time they will be permanently deleted from Sfax.